Life has bee pretty crazy lately so I have been setting my goals pretty low. Last Monday my main focus was to get hay in my barn. Seemed to me like a reasonable thing to get done but it proved to be quite an adventure. 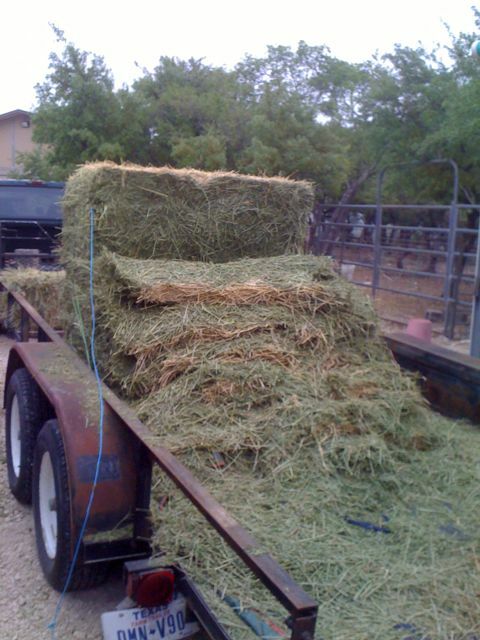 It started when I called to check with Joe Ben, at J & B feed in Manchaca, to make sure the expected load of hay had indeed arrived. Well it did arrive but Joe Ben did not like the quality so he did not keep it. He did not expect to have any grass hay until next month when the first cutting came in. I feed mostly grass hay and I had not been feeding any alfalfa because of he cost. My animals, especially the milk goats, have missed the alfalfa but at $23 a bale I just could not justify it. Cerise, my Fire horse temperament mare, was also unhappy with me and Tess, my 31 year old mule was losing some condition on just the grass hay. I knew Joe Ben had some beautiful alfalfa at a great price but it was in 4 by 4 by 8 foot bales and getting it into my barn would be a challenge. Nevertheless, I decided that it was time to get one of these big bales of alfalfa to hold my horses until the coastal cutting came in. They were getting some nice grass in the pasture so that could make up for the loss of grass hay. I would need the flatbed so first order of business was to air up the tire on the trailer that had a slow leak. Once this was done I set off about 11 AM to get the hay. Even after to moving to Fischer I have stayed with J & B feed which is about an hour drive back toward Austin. I find most feed store owners very helpful and friendly but Joe Ben seems like part of the family so I don’t mind making the drive. About 15 miles down the road the truck started vibrating and I suspected I had a bad tire. Since I was about to be pulling 1800 pounds of hay I decided to turn back to Petersen Tire in Blanco and get my tires checked. Sure enough the right rear was bad but the shop did not have a match for the same tire I had recently bought for the left rear. Faced with having to start over the next day I decided to go for a more expensive tire and keep moving towards my goal of hay in the barn that day. My trailer tire was repaired at no charge and that was a nice surprise. Once back on the road I called my business partner, Stephanie, as we had had a meeting scheduled for when I thought I would be back from getting hay. After discussing business we were chatting away when I realized I had no power steering. Just being a few miles from the feed store I thought no big deal until I realized I also had no power brakes. I pulled over and called Joe Ben to see where I could take the truck for repair. This entry was posted in Other Stuff on March 29, 2012 by Madalyn Ward, DVM.